Pataliputra or Patna, in Magadha. King Asoka’s Spirit-Built Palace and Halls. The Buddhist Brahman, Radha-Sami. Dispensaries and Hospitals. Having crossed the river, and descended south for a yojana, (the travellers) came to the town of Pataliputtra, in the kingdom of Magadha, the city where king Asoka ruled. The royal palace and halls in the midst of the city, which exist now as of old, were all made by spirits which he employed, and which piled up the stones, reared the walls and gates, and executed the elegant carving and inlaid sculpture-work,— in a way which no human hands of this world could accomplish. King Asoka had a younger brother who had attained to be an Arhat, and resided on Gridhra-kuta hill, finding his delight in solitude and quiet. The king, who sincerely reverenced him, wished and begged him (to come and live) in his family, where he could supply all his wants. The other, however, through his delight in the stillness of the mountain, was unwilling to accept the invitation, on which the king said to him, “Only accept my invitation, and I will make a hill for you inside the city.” Accordingly, he provided the materials of a feast, called to him the spirits, and announced to them, “To-morrow you will all receive my invitation; but as there are no mats for you to sit on, let each one bring (his own seat).” Next day the spirits came, each one bringing with him a great rock, (like) a wall, four or five paces square, (for a seat). When their sitting was over, the king made them form a hill with the large stones piled on one another, and also at the foot of the hill, with five large square stones, to make an apartment, which might be more than thirty cubits long, twenty cubits wide, and more than ten cubits high. In this city there had resided a great Brahman, named Radha-sami, a professor of the mahayana, of clear discernment and much wisdom, who understood everything, living by himself in spotless purity. The king of the country honoured and reverenced him, and served him as his teacher. If he went to inquire for and greet him, the king did not presume to sit down alongside of him; and if, in his love and reverence, he took hold of his hand, as soon as he let it go, the Brahman made haste to pour water on it and wash it. He might be more than fifty years old, and all the kingdom looked up to him. By means of this one man, the Law of Buddha was widely made known, and the followers of other doctrines did not find it in their power to persecute the body of monks in any way. 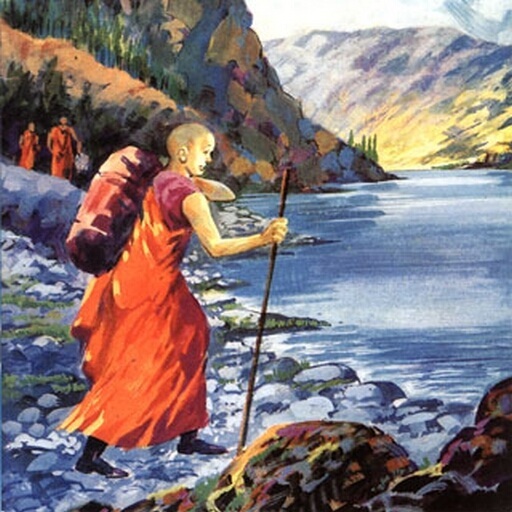 By the side of the tope of Asoka, there has been made a mahayana monastery, very grand and beautiful; there is also a hinayana one; the two together containing six or seven hundred monks. The rules of demeanour and the scholastic arrangements in them are worthy of observation. Shamans of the highest virtue from all quarters, and students, inquirers wishing to find out truth and the grounds of it, all resort to these monasteries. There also resides in this monastery a Brahman teacher, whose name also is Manjusri, whom the Shamans of greatest virtue in the kingdom, and the mahayana Bhikshus honour and look up to. The cities and towns of this country are the greatest of all in the Middle Kingdom. The inhabitants are rich and prosperous, and vie with one another in the practice of benevolence and righteousness. Every year on the eighth day of the second month they celebrate a procession of images. They make a four-wheeled car, and on it erect a structure of four storeys by means of bamboos tied together. This is supported by a king-post, with poles and lances slanting from it, and is rather more than twenty cubits high, having the shape of a tope. White and silk-like cloth of hair is wrapped all round it, which is then painted in various colours. They make figures of devas, with gold, silver, and lapis lazuli grandly blended and having silken streamers and canopies hung out over them. On the four sides are niches, with a Buddha seated in each, and a Bodhisattva standing in attendance on him. There may be twenty cars, all grand and imposing, but each one different from the others. On the day mentioned, the monks and laity within the borders all come together; they have singers and skilful musicians; they pay their devotion with flowers and incense. The Brahmans come and invite the Buddhas to enter the city. These do so in order, and remain two nights in it. All through the night they keep lamps burning, have skilful music, and present offerings. This is the practice in all the other kingdoms as well. The Heads of the Vaisya families in them establish in the cities houses for dispensing charity and medicines. All the poor and destitute in the country, orphans, widowers, and childless men, maimed people and cripples, and all who are diseased, go to those houses, and are provided with every kind of help, and doctors examine their diseases. They get the food and medicines which their cases require, and are made to feel at ease; and when they are better, they go away of themselves. North from the tope 300 or 400 paces, king Asoka built the city of Ne-le. In it there is a stone pillar, which also is more than thirty feet high, with a lion on the top of it. On the pillar there is an inscription recording the things which led to the building of Ne-le, with the number of the year, the day, and the month.